A slew of Raiders fans gathered at Ricky's sports bar Monday to share in the sorrow and disappointment they were feeling after the NFL approved the team's relocation to Las Vegas. The owner of Ricky's Sports Theatre and Grill in San Leandro said his establishment will continue to support the team, no matter where they play home games. And some fans were feeling the same way. "My dad took me to my first game when I was 5 years old," said Nancy Battilana, who was celebrating a birthday Monday while mourning the loss of her favorite team, calling it the "worst birthday present I’ve ever had." Battilana said she won’t pay to see the Raiders play in Las Vegas, but she will cheer them on from home, something heard often around Ricky's on Monday. 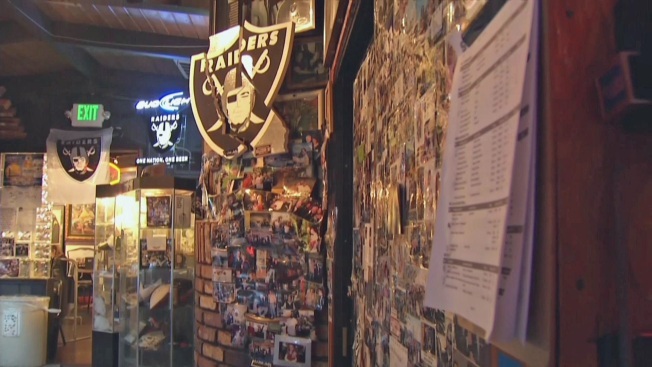 A slew of Raiders fans gathered at Ricky's sports bar Monday to share in their sorrow and disappointment they were feeling after the NFL approved the team's relocation to Las Vegas. Michelle Roberts reports. Still, others were feeling angry and bitter about the Raiders' impending departure. 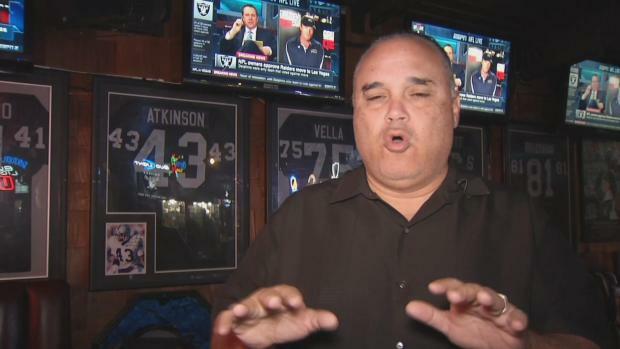 Rob Rivera, president of the Black Hole Fan Club, said he’s already heard an overwhelming response from season ticketholders who are planning to cash out. "A big part of our soul has just been damaged and taken away," he said. "There was an option here in Oakland, with the most loyal fans in the NFL, and you guys just ripped that away, with no heart." Mark Acasio, who is known as "Gorilla Rilla," has had season tickets for 21 years. "My stomach just dropped," he said. "It's like my girlfriend cheated on me, my wife cheated on me." Season ticketholders Gary and Nancy Dowell agreed: "This was a big part of our lives they're going to be taking away from us." Ken Webb, known as "Afro Deesiac," is a 15-year season ticketholder. "I'm old enough to remember the first time they left," he said. "There's only so much you can take." The Raiders still have two or three more seasons at the Coliseum, and fans are mixed on what they'll do next. "I paid for my season tickets this year, and then I'm not buying them next year or the year after that," said Debbie White, a season ticketholder since 2012. "I just can't go to that stadium and pretend everything's great," Webb said. "I just can't do that." Andy Dolich, a former NFL and NBA executive who's dealt with moving franchises before, said he expects fans will show up. "Ultimately, I think the majority of fans, based upon the way the team is playing, even with their frustration and their anger, will be coming to games at the Oakland Coliseum," Dolich said. Some fans said the NFL's decision will make them think twice before tuning in on game day. And while some fans make new plans for Sundays in the fall, there are even a few die-hards that say the fight isn’t over yet. "Stadium deals are very complicated," said Chris Fry-Lopez, vice president of Save Oakland Sports. "So, for the most part, I’m very sad today, but I’m not done fighting to keep the Raiders in Oakland." Save Oakland Sports said it is working on a couple of ideas to keep the team in Oakland but added that it isn't ready to announce anything yet. Raiders owner Mark Davis has said if any Raiders season ticketholder wants a refund, he will grant it.